ESP Auto Inc., Services: Exhaust Systems | ESP Auto Inc. It may be true that exhaust systems are not the most glamorous part of any vehicle, but all of our techs will agree that they’re one of the most important. But how much do you know about this vital component of your car? Here’s a cheat-sheet to get up to speed with what’s hidden out of view under your ride. 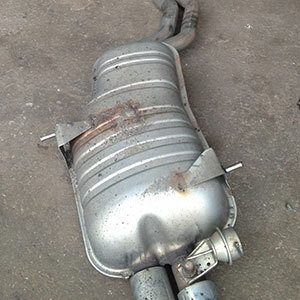 The muffler is the part you can see at the rear of the car and its job is to soften – or ‘muffle’ – the sound of a vehicle’s engine as the emissions pass out of the exhaust system. The little-known resonator assemblies combine pipe routing and tuning technologies for quality flow and acoustics. This ‘cat’ has the job of converting harmful engine emissions to CO2 and water. If you ever wondered why your vehicle’s twisting and turning on the highway doesn’t damage the exhaust system, you have this little part to thank! The flex pipe allows the engine to move naturally without it causing damage to the exhaust system. Another unsung hero, the manifold is typically made of cast iron or fabricated tubing and connects to the engine at the exhaust ports with flange connectors. If your car has a catalytic converter, it is often housed in the manifold, as the job of the manifold is to collect exhaust gases from each cylinder, before funneling them into a common outlet. Contact us today if you would like to schedule an appointment for your exhaust system!